You can see how the swelling my left hand developed about 6.30 this evening, so I went down to the casualty department of the local hospital. I was too busy talking about the kidney problem, the bone marrow biopsy and the kidney biopsy, not to mention the perforated appendix that I forgot to tell the doctor the really relevant information that I had my spleen removed about three years ago. When I get an infection, I need to report it, but I think it is only minor it will go away. Let me not trouble people unnecessarily, and then the symptoms do not go. I get given a diary every year, and I never fill it out consistently. My resolution this year is to record any observations I make about my health so I can relate them to the relevant doctor. The problem in consultation is that I do not have a check list of things to report, nor do I record the results of tests. Then again it is so easy to miss the big things, such as my splenectomy. My local doctor has full records, but it is hard to review them all in a single consultation. I am trying out this method, which I hope has a reinforcement loop embedded in it. We will see how this goes. This post is reminder to apply myself to the project. The casualty doctor gave a course of oral antibiotics. My hand is now looking a lot more swollen. Photos to follow if there is not improvement by tomorrow. I do not like to whinge, or even see doctors – does that sound familiar? The most popular post on this blog was my report on my swollen thumb. My recommendation, it goes without saying, and subject to possibility, is to go and see a medical doctor. As for the palmist out there, only tell me the good news. You can see how the swelling my left hand developed about 6.30 this evening, so I went down to the causality department of the local hospital. I was too busy talking about the kidney problem, the bone marrow biopsy and the kidney biopsy, not to mention the perforated appendix that I forgot to tell the doctor the really relevant information that I had my spleen removed about three years ago. UPDATE: 8 hours later:The swelling has increased and spread to the right hand. So far there is no diagnosis. I spent the morning that the Medical Practice. This case and outcome, reinforces my conviction about the importance of access to health services and the importance that I perhaps did not fully appreciate of information flows, so that . for instance, general local conditions can be identified, and then be elated to particular cases.And pushing the generalization some further steps along the way. I would suggest there is a form of globalization of health science from the bottom up, more so than in other fields. But feel free to disagree with me, as I know you always do. For the impact on medical providers when things go very wrong, I suggest you read Colleen’s experience as an intensive care nurse, which is a reminder to me that as patients and family members we should not forget the people that provide the medical services we are reliant on. There was an annonymous multiple commenter who seems to think that I was complaining. The swelling I imagine was some kind of reaction to what I had contacted while cleaning up over the backfence. The prudent course is to where gloves. The photos help to document what happened. At the time, and it is now eleven months I was not given, or able to discover cause and effect story, and for that reason the experience was interesting. I notice my neighbour was wearing gloves when was working in a similar area. The rules for commenting here are elementary – be courteous and does not preclude criticism. Interesting. Just two days ago,m my left hand was swollen and I first noticed it just before my shower in the AM.. My watch was hard to get off so I mentioned this to my wife and I thought the end of the world had happened. Needless to say, we scheduled an appointment with our primary care physician and he made an appt. to have a blood test (D-Dimer) done and the results came back later the evening. The Dr. called me at home and sounded quite concerned and told me to get down to our local hospital and have an Ultra sound done on my upper left extremity. Said that my score was in the upper 700’s which is much higher that the norm of 250. To make a long story short, No Blood clots noticed and the Dr. then sceduled me in the next day to have another Ultras Sound and this time it was performed on my legs. Still no blockage or clots. As of this time 1-5-08, I have no pain, ankles are swollen which they have been for a couple of years and left hand is still slightly swollen. I am waiting now for another appt. with the Primary Physician and I guess we will go from there. I am being treaqted with medication -diuretics to bring this situation down. Keep me posted as to your condition- (I have never ever posted a “Blog” so I don’t know if I am following the right protocal or not. Thank you so much for your comment Troy. It would seem my condition, despite my scepticism, was caused by a bacterial infection affecting both hands for some reason. Despite the similarity of some symptoms, the underlying conditions might be might be different..This to me underlines the importance of reference to a trained physician who can go down the right decision trees and make the appropriate judgment calls. For example, I notice now that my doctor did check me for blood clotting, although I did not appreciate it at the time. I am very impressed as well with the behavior of your doctor, which reminds me that medicine can be seen solely in the frame of a business. I say to my doctor, “Medicine is science, and therefore we should have explanations for symptoms”. She says that we have to be practical and solve problems. That said, I hope that your condition Troy can be cleared up, and even explained. So I have, it seems, just experienced another malady that comes, and then goes. Sometimes the symptoms can be more permanent as appears to be in Troy’s case. Even without the software, a medically-orientated and specialized diary would be better than nothing to help tell the story of what has happened between visits. Of course, with digital photography and a blog I can use this means, although I feel bad about inevitably sharing this stuff. To be honest without the photos I would have trouble remembering and describing the detail of my condition. In 2004 I was dignosed with kidney stones and kidney cystes (mulitple) on the left kidney. Six weeks ago I went to the hospital once again for my stones and I was told my protein in the urine was high and a plus three(3) for the blood in my urine. The past three weeks my left hand is swallen in the morning. I was wondering would this have anything to do with my kidneys? What should I do? Is this serious or not? Fifteen months ago my dad passed away with kidney failure on the second day of dialiss treatment. Good questions CS. I don’t know. But I have a kidney illness – glomerulonephritis – so there might be a connection I had not recognized..
wmmbb. Maybe. You might want to check into it. You are probably right CS. Thanks. First time I have ever written. I woke up about 30 min ago with swollen hands. this action, did work and the swelling went down.within 30 min. i can feel the action happening\ mainly in your head and face. there was a problem it was burning the roof of my mouth and lips. i took the drink 30 min ago the swelling has gone down 50-60 % and is still working . I truly feel better doing this. even my eye sight changed (sharper) . This post may be too old to add an Update. Over the last two days I have had a recurrence of the swelling in the left hand. This time the events are somewhat different. On the 5th of this month I came in the back door catching my foot in the dog flap and fell onto the tile floor. My hand and lower arm became swollen. After some days the swelling went away. Since I had to attend the hospital next day, I organized some x-rays, which were not then as they should have sent on to GP. I did not have any ice at the time, so I could not pack the area with ice at the time of the fall. I was not exactly sure what the right thing to do was. The tablets, I am now one, which worked last time, are dicloxicillan sodium (500 mg). The choice of this medication is related to my existing medication and allergy. Sorry about not replying as I should have done. The thing return to normal, at least, I then to forget about them. It is interesting, I would have thought, that condition is confined to the left hand, and has now returned. This phenomenon is not seasonally related. We are now experiencing the Southern Winter. One tip. As you might imagine my fall was I imagine an unsightly spectacle accompanied by dreadful exclamation, although not swearing. I have a mantra that kicked in, and I focus repeating that rather than my imagined. In the past it has worked, and I think it worked this time. A mantram is a word or short phase that can be repeated. It might just work for you as well. I owe this device to Michael Nagler at The Metta Centre. The swelling and redness in my left hand has now gone. The tablets worked. It would still be useful to find out what caused the problem. The prescribed medication worked for me anyway. Now the strain in the wrist has gone as well. Until next time, I suppose. Are any of these conditions painful? 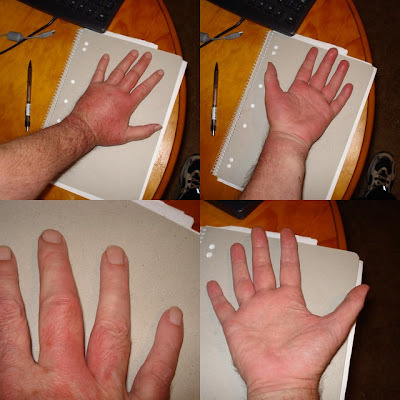 Two days ago my left hand swelled up and turned bright red? It is extremely sore as well. Fingers are bent and cannot straighten. Any ideas? I don’t remember any pain. If possible, see a doctor as soon as you can. I hope it goes well.